The medieval town of Minerve lies a few kilometres north of Carcassonne, in the south west of France. The flat landscape rears into sudden rock, half-covered with scrub and bushes. 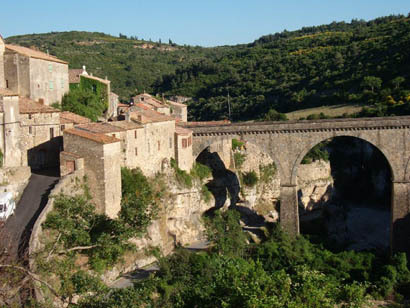 The gentle slopes are carpeted with vineyards and the wine of the area, Minervois, is justly famous for its excellence. Little roads ray out like spider webs from the villages, dividing, doubling back on themselves and meeting up again. But there is only one road that leads to, and from, Minerve. At the end of this road, you’re faced with a narrow bridge across a deep ravine. The road divides into two tracks, running to right and left of the bridge. This is as far as cars can go. On the other side of the bridge, the village itself is partly cut into the rock. It stands alone on its pinnacle of rock, surrounded by the ravine. It slumbers in the summer heat, silent except for the birdsong and the drowsy sizzling sounds of the crickets. At the extremity of the rock, a long finger of stonework points to the sky. From a distance it looks like a tower but in fact, is the last remaining part of the medieval castle that dominated the town when it was besieged in the summer of 1210. The besieging army was led by Simon de Montfort. His assorted troops were drawn from various areas which are now part of France but in those days were separated principalities – such as Brittany, Lorraine, and Champagne – as well as from France itself (the present Ile de France area) and Germany. The army was raised – and paid for – by the king of France, Philippe le Bel, and the Pope, Innocent III. The troops converged on the opposite side of the ravine and camped there. In those days, there was no bridge spanning the gulf of the dried-up river bed, so there was no question of storming the rocky citadel or of any hand to hand fighting. As Michel Roquebert says, Simon de Montfort’s two weapons were ‘time and artillery’. The cannons soon crushed the well, the villagers’ only source of water, and pounded the castle and the buildings. The siege lasted about five weeks and the besieged people succumbed less to physical injuries than to drought, starvation and disease. In the end, the feudal lord, Guillaume de Minerve, gave himself up. So what had this small village built into the rock around a gorge, done to deserve the wrath of both the Pope and the French king? Guillaume de Minerve had offered shelter to 140 Cathar ‘parfaits‘ in his citadel fortress. It was this handful of people that the army were after. After Guillaume surrendered, Simon de Montfort agreed to lift the siege and offered life to the ‘heretics’ on the condition that they renounced their beliefs and converted to ‘l’Eglise’ i.e. the Roman Church. If they would not, then they were to be burned. It is said that he had no doubt that they would choose death rather than conversion, and he was right. The siege was lifted, Guillaume himself was spared but a large pile of wood was collected, to form the funeral pyre for the 140 Cathars. The Cathars recognised that in the Bible there were two gods, two beings called by the same name. There was the good, all-loving and merciful one and the vengeful, punishing one. The former created the invisible spiritual world and the latter, the visible one. They called him Rex Mundi and considered the world in which we live to be a battleground between the forces of light and darkness, a place were souls were entrapped in matter and engaged in a struggle to free themselves from this entrapment. To this end they advocated leading simple lives, not acquiring riches or many possessions, and treating others well. Their biggest ‘sin’ in the eyes of the Roman Church was that they did not bow to its authority. They did not recognise the need for priests, for any intermediaries between persons and the good god. Their ‘way’ was truly a way of life, a practice. They preached, but did not exhort and certainly did not punish. They won hearts by their living example. This was too much for the Roman Church to stomach. It dubbed them heretics and Pope Innocent III wrote in a letter to his legates, ‘ils sont pires que les Sarrazins’, they are worse than the Saracens. The Pope convinced the king of France (the Languedoc was not then part of France), Philippe le Bel, to join forces in a crusade against the Cathars. The king would gain territory, annexing the Languedoc and making it part of France, and the Pope would get rid of the heretics and restore the authority of the Roman Church. Mercenaries were recruited by means of the ‘quarantaine‘ – if they served in the army for 40 days they would receive the Pope’s indulgence and their sins would be absolved – not just past sins but any they might commit in the future. But that was just the beginning. This was a long, drawn-out campaign. The main difference from other crusades, apart from the fact that this was Christians killing Christians, was the inequality of the two sides. The people of the Languedoc had little stomach for fighting, especially after the horror of Beziers. They were defending their territory, which was made up of small principalities under their ruling nobles. They had their own fighting men of course, but nothing like the combined army of the Pope, the king of France, and mercenaries who believed that they were acquiring a ticket to heaven. The best the local counts and viscounts could do was barricade themselves into their towns or castles and hope that the siege would not be broken. The Pope’s armies picked off the territories, one by one. They began with the towns – Beziers, Toulouse, Carcassonne, Minerve – and then proceeded to the castle fortresses – Peyrepetuse, Queribus, Termes, and Monsegur. With the fall of Montsegur in 1244, the last resistance was effectively destroyed, the last stronghold gone, and the ‘heresy’ wiped out. The country of the Languedoc was no longer independent and the lands of the counts and princes of Toulouse and Carcassonne and other smaller city-states were ceded to the king of France. The remains of many of these castle fortresses still exist. They are all perched high on the tops of rocky escarpments rising suddenly out of plains and otherwise undulating landscapes, and they still have the capacity to evoke unsettling feelings of wonder mixed with unease. What kind of people built such castles, how did they live there and why were they so persecuted? are just some of the questions that arise in one’s mind at the sight of these magnificent ruins. In Citadels du Vertige, Michel Roquebert provides some background to the stark historical facts, giving us a glimpse into the culture of the time. The songs of the troubadours date from the same era as the Cathars, and he suggests a link between them. In the songs of the troubadours he says, ‘sensuality became idealised, passion became the source of a mystical joy which gave the soul access to a higher consciousness’. By the time of the Cathar crusade, ‘the values of love became transformed into religious values’. He wonders if the troubadour lyrics were influenced by the Cathar values and practices, since ‘the poetry of courtly love and Catharism were both developed in the same atmosphere of spiritual exaltation, with the same longing for transcendence’. ‘The troubadours … were well aware that immediate satisfaction destroys love’. He suggests that courtly love is an ‘éthique du désir’. Its concern is not to deny or repress desire; on the contrary it exalts it, giving ‘more strength to desire – more sublimity to patience, discreet adoration, respect, fidelity, resistance to the severest testing’. The aim of this ‘moral energy’ was to completely transform the individual. This refining of the physical desires was undertaken for the express purpose of attaining mystical states of consciousness which endowed everything with meaning. It was, in other words, a spiritual path, or way. But the following of this path was neither easy nor comfortable; it necessarily involved a dangerous psychological terrain – traversing depths of anxiety and heights of exaltation. ‘There was only’ he says, ‘- despair – or grace’. ‘The fortified castles of the Cathars are also citadels of that kind of vertigo.’ In other words, the inner landscape of the troubadours, following the path of the spiritual practice of ‘courtly love’, had a physical parallel in the outer landscape – the ravines and the mountain tops where the Cathars built their castles ‘touching the clouds’. These refuges of the ‘heretics’ were high places both literally and spiritually. 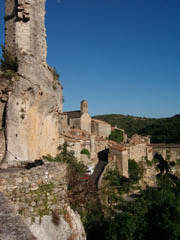 Roquebert also suggests that a fortified castle is more than a place to live; ‘a second skin, a kind of magical armour against the world’s hostility.’ Its vertiginous situation, the incredible thickness of its walls and the labyrinth of its defences, he suggests, show not so much true power as great vulnerability. ‘It’s the most vulnerable and unarmed creatures’, he says, ‘who grow shells.’ The carapaces of Montségur, Quéribus, Peyrepetuse and Termes show ‘not so much true strength as a kind of sacred terror’. The Cathars saw the physical world as the arena of the struggle between the dark and the light. In this dimension, as their strongholds were wiped out one by one, they clearly lost. But their lack of fear of death was astonishing. There was no need, it was recorded, for them to be pushed into the blazing bonfires – they threw themselves on the flames. Like the troubadours, the Cathars did not renounce life or shun it – their aim was to transmute life’s passions and energies, refine them and cleanse them of polluting habits and beliefs, and so become closer to compassion and mystical awareness of the one-ness of all life. Fear, it is said, comes from the lower desire body whose very sense of self arises from habitual gratification, and so fears its loss as its death. Only when one has transformed and realigned one’s sense of identity to the higher perceptions does one lose fear of death, for the physical body is not one’s real self. The Cathars’ lack of fear of physical death suggests that they had reached that pinnacle of self-awareness which can only be seen as a tremendous spiritual success. Spiritual beliefs and practices cannot be killed. In today’s ‘secular’ world there are many people searching for their own spiritual path, outside of the structures of organised and orthodox religion. 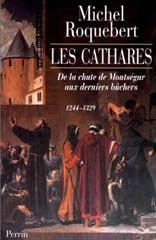 Many are drawn to the Cathars’ ideas and way of life. Their castles may be in ruins, but the landscape is still there, and the memories it holds, and the eternal human questions – what is our true identity and what is our purpose here on earth? No one can answer these questions for us, but landscapes like the rocky pinnacles of the Languedoc may help to jog our memories.